10 reasons to vote for G4S as the World’s Worst Company…and why G4S disagree! The world’s leading security company, G4S, says it doesn’t deserve to be nominated for Public Eye’s World’s Worst Company Award. Two activists examine G4S’s defence. The World’s Worst Company will be declared this Thursday by Public Eye, an initiative of the of the Berne Declaration and Greenpeace Switzerland. The charity War on Want nominated G4S for the uncoveted award. Lately on OurKingdom (10 January) we offeredten reasons why G4S deserves to win. That same day the company sent a 150 word letter to the London-based Business and Human Rights Resource Centre opposing the nomination. Here we interrogate G4S’s rebuttal. We are activists who have scrutinised and resisted G4S’s activities in asylum seeker housing in the UK, and the company’s role in Israel’s occupation of Palestine. As we write, G4S lies third in the public voting for the World’s Worst Company, behind Shell and Goldman Sachs, and ahead of Repower (energy), Lonmin (formerly Lonrho— South African mining), Coal India and Alstom the French energy and transport conglomerate. We say: G4S appears to be responding only to one brief paragraph published byPublic Eye. In fact War On Want, Boykot G4S, Boycot Isreal Network, Corporate Watch UK, Jews for Justice for Palestinians, Palestine Solidarity Campaign (UK), submitted lengthy petitions to nominate G4S. The Institute for Business Ethics (IWE) at the University of St. Gallenexamined the nominations in relation to human rights, labour rights and environmental issues against the backdrop of international accords and standard. Such international standards are represented by UN Resolutions, Declarations, Conventions, OECD Guidelines, the Fourth Geneva Convention and the UN Guiding Principles on Business and Human Rights. Following the assessment by the University of St Gallen, an international jury selected the most irresponsible corporations. The jury consisted of four independent business ethics experts and four members who represented the Berne Declaration and Greenpeace. In a few key strokes, G4S dismisses the work of the University of St Gallen and the international jury. We say: The workers of G4S themselves, and their unions, have over the past few years systematically exposed the fact that G4S workers are “often badly trained and paid”. Back in 2008, UK charity Medical Justice’s Outsourcing Abuse documented 300 cases of alleged abuse in the carrying out of deportations and other “immigration and asylum services” on behalf of the UK government. G4S held the highest rate of abuse. The abuse involved excessive force, resulting in injuries to the face and injuries as a result of restraints. In October 2010, Angolan man Jimmy Mubenga who died under ‘restraint’ by G4S guards contracted to the UK Border Agency. In the aftermath of Mubenga’s death, G4S whistleblowers gave evidence to the UK Parliament in February 2011 alleging that poorly trained G4S staff on deportation flights “played Russian roulette” with peoples lives. Later that year the BBC revealed that 773 complaints had been lodged in 2010 against G4S staff by detainees, including 48 claims of assault, and the UK Chief Inspector of Prisons reported G4S guards using extremely offensive racist language on deportation flights. In 2007 War on Want and trade union researchers exposed G4S violations of international labour codes in South Africa, Malawi and Mozambique. White G4S managers in South Africa were accused of forcing black employees to use separate toilets“while white guards are given keys to the company toilet. And black G4S guards at Johannesburg airport complain that white supervisors call them ‘kaffirs’ and ‘monkeys’”. Corporate Watch reported in February 2012 that workers in Nepal, South Korea, and Malawi were starting or threatening strikes and hunger strikes protesting about wages and conditions offered or paid by G4S. In May 2012 the UNI Global union accused G4S in India of paying “poverty wages” and“intimidating workers who speak out for their rights”. In 2011, G4S Armor Group private security guard Danny Fitzsimons in Iraq was imprisoned for twenty years for the murder of two of his fellow guards and the wounding of a third in Iraq. Following an investigation by BBC Scotland, a G4S spokesman admitted to the BBCthat its screening of Danny Fitzsimons “was not completed in line with the company’s procedures”. G4S says: G4S staff do not “man checkpoints” or “manage prison security” in Israel. We say: The company is undoubtedly complicit in Israel’s restrictions of freedom of movement of Palestinians. In July 2012, Israel’s defense ministry confirmed that G4S is one of the companies that provides inspection services and scanning equipment to all the Israeli checkpoints along the separation wall in the West Bank. G4S Israel signed a contract with the Israeli Prison Authority to provide security systems for Israel’s major prisons in 2007. Independent lawyers commissioned by the UK government in 2012 published a report, Children in Military Custody, which described Israel’s transfer of thousands of Palestinian prisoners including children, from the occupied territory to military prisons inside Israel as a violation of Article 76 of the Fourth Geneva Convention. Palestinian child prisoners are regularly subjected to torture and ill-treatment in several G4S equipped “security”prisons. By providing equipment to these prisons, G4S is complicit in Israel’s violations of international law. We say: G4S subsidiary Armor Group operates in the world of Private Military and Security Companies (PMSC’s). For example, Armor Group was subcontracted by the US Air Force in Afghanistan. According to a 2010 report of the United States Armed Services Committee, G4S “relied on Afghan warlords, some of whom were Taliban supporters, to provide manpower for the company’s guard force at the airbase.”G4S has since tried to argue that it was simply following the practice of the US armed forces in Afghanistan. G4S is not just a ‘private security company’: it is also in part a private army, privatising war. Our response: The nomination criticises G4S and its corporate management, not its workers. With a few shots in the dark, G4S dismisses serious public concerns about the company’s record of violations of human rights, labour rights and international law. The quality of its response speaks volumes. The infamous Public Eye award wants your vote on the company that most deserves naming and shaming. Activists from South Yorkshire to the Canton of Vaud are backing security company G4S to win. Here’s why. War on Want has nominated G4S as the world’s worst company in this year’s Public Eye Awards, an initiative of the Berne Declaration and GreenPeace. The winner of the award for the worst record of corporate human rights abuses and environmental misdeeds will be announced on 24 January at the World Economic Forum in Davos. The public will decide and competition is tough. Investment bank Goldman Sachs currently leads the voting in a list of finalists that includes energy companies Repower and Shell, South African mining company Lonmin (formerly Lonrho), Coal India and Alstom, the French energy and transport conglomerate. We are backing G4S, the world’s largest private military and security company, with operations in 125 countries and 657,000 employees, which caught international attention with its shambolic performance as security provider for the London 2012 Olympics. We are John Grayson and Adri Nieuwhof, activist researchers. UK-based John, working with South Yorkshire Migration and Asylum Action Group (SYMAAG), has chronicled G4S’s attempts to extend its asylum and detention markets into asylum seeker housing. Adri Nieuwhof, a human rights activist based in Switzerland, monitors and exposes G4S’s role in Israel’s occupation of Palestine. Here are 10 reasons why we think G4S deserves to win. G4S owns the ArmorGroupand has ordinance management operations in 26 countries. Its Gurkha Services arm trains the British army for combat duties. In 2010 and 2012 respectively, the US Senate Armed Services Committee and the UN watchdog Global Policy Forum published criticism of G4S as a military contractor. According to War on Want, the criticism did not stop the British government from extending armed security contracts with G4S in Afghanistan, understood to be worth £72 million. 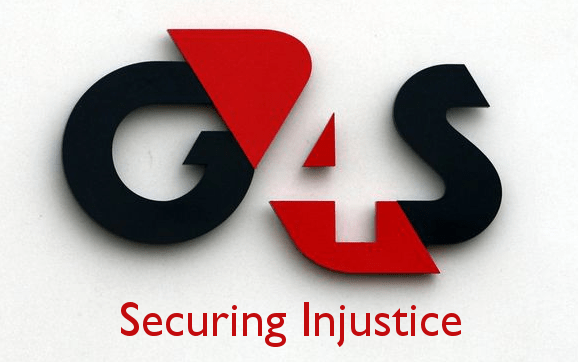 G4S owns 90 per cent of its subsidiary G4S Israel (Hashmira) which supplies services to the Israeli police, the Ministry of Defense, the Israeli Prison Service, the Israeli army, and the settlement businesses. Over 4,500 Palestinian political prisoners, including 177 children, are held in Israeli jails. Israel transfers Palestinian political prisoners from the occupied territory to prisons in Israel in breach of the Fourth Geneva Convention. G4S also provides security services to the detention and interrogation facilities to the “Russian Compound” in Jerusalem and to “al-Jalameh” detention centre in Haifa where Palestinian teens are interrogated. In January 2012, the Guardian reported that Cell 36 of al-Jalameh prison is one of the cells where Palestinian children are locked in solitary confinement for days or even weeks. According to Defence for Children International Palestine section, in the past 11 years around 7,500 children, some as young as 12 years, are estimated to have been detained, interrogated, and imprisoned in Israeli military and ‘security’ prisons. This averages out at between 500 and 700 children per year. To investigate the treatment of Palestinian children under Israeli military law, the UK Foreign and Commonwealth Office commissioned a group of lawyers. In their report ‘Children in Military Custody’ published in June 2012, the lawyers argue that Israel breaches international human rights standards including the UN Convention on the Rights of the Child and the Geneva Convention by its treatment of Palestinian child prisoners. G4S makes profits from the UK’s asylum support regime, a “system of institutionalised inhumanity” designed not to support those seeking asylum in the UK, but to deter others from coming to the UK, according to the distinguished immigration barrister Frances Webber in her book Borderline Justice. Webber describes “a monstrous regime of bare subsistence and a deterrent system of coercion, control and stigmatisation”.G4S has extended its interests in these asylum markets with part of a five year UK Border Agency £600 million contracts to control transport, dispersal centres and housing for those waiting for decisions on asylum claims. G4S pioneered police and prison privatisation in the UK and is poised to profit from the freshly privatised probation market too. At present, the UK has more private prisons than anywhere in Europe, even more than in the US. G4S has run privatised UK children’s prisons or secure training centres since 1998. Fifteen-year-old Gareth Myatt died in April 2004 under ‘restraint’ by G4S staff at Rainsbrook Secure Training Centre near Rugby. There had, for years, been concerns about staff bullies and restraint techniques that caused ‘positional asphyxia’. In a High Court judgment on 11 January 2012, Mr Justice Foskett found it highly likely that large numbers of children were unlawfully restrained in secure training centres run by G4S (and Serco) between 1998 and 2008. Despite its history of abuse at Rainsbrook, G4S runs “a purpose-built mother and baby unit to care for detained young mothers and their babies”. G4S uses charities both as a Trojan Horse to penetrate and control freshly marketised areas of the public sphere, and as a fig leaf covering up human rights abuses against children. G4S is linked up with the UK’s leading children’s charity Barnardo’s in the exploitation of prison and asylum markets. Through this partnership G4S accessed £3m of Big Lottery funding for projects with Barnardo’s at its two private prisons in South Wales. Now G4S and Barnardo’s jointly run the Cedars immigration removal detention centrewhich continues to lock up children and has been the scene of abuses against migrant families who were deported from the centre. G4S has been adept at using business figures, and celebrities to enhance its image and lobbying power. G4S’s latest catch is Adam Crozier, chief executive of the major media group ITV, Crozier previously headed advertising agency Saatchi and Saatchi. No matter how experienced Crozier is, he will not be able to whitewash G4S’s record of corporate human rights abuses. (6) The company has systematically recruited as advisors and board members high profile UK politicians like Lord (John) Reid, former Labour Home Secretary, policemen such as Lord Condon, former commissioner of the Metropolitan Police, and civil servants. The UK’s ambassador to Libya during the Arab Spring, Richard Northern, was recruited in January 2012 to advise G4S on security business prospects in the region. In June 2012, sixty UK Members of Parliament signed a motion to bar firms with dubious human rights records, like G4S, from government contracts. The motion cited the European Parliament’s cancellation of a G4S security contract because of its prison business in Israel. Since Parliamentary hearings on the Olympics contract, the company has lost UK prison contracts, police contracts and a major contract for assessment of disabled people. And yet all the three main Westminster parties Conservatives, Liberal Democrat, and Labour, used G4S for security at their annual conferences in the autumn of 2012. G4S funds the development of its prison estate, detention and asylum markets, not from its own private capital, but from taxpayers’ money. There is little risk involved for G4S and income and profits are guaranteed over very long periods. These public contracts ensure G4S can reward its own ‘fat cats’. G4S chief executive Nick Buckles according to the Annual Report in 2011 gets an annual salary and shares worth £2.4 million and a possible annual bonus of £1.2 million. His pension pot is at present worth £7 million. Meanwhile, in a G4S mother and baby hostel in Stockton on Tees in the North East of England, under the government’s asylum housing contract, 38 children under one and a half live in what their mothers describe as ‘cells’. Your vote for G4S is a protest against the company’s corporate human rights abuses, and a vote of solidarity with the protests of Palestinian political prisoners and child prisoners in Israeli jails, asylum seekers in UK detention and removal centres, asylum seeker and child prisoner mothers and babies in G4S UK hostels, and a vote of solidarity with all those individuals and organisations campaigning against G4S, the Worst Company in the World. War on Want have made a video – featuring a Stop G4S demonstration in Sheffield – to give you some background on the multiple human rights abuses of G4S around the world. Adri Nieuwhof, Palestinian children testify about cruel treatment by Israeli soldiers in new short film, blog The Electronic Intifada, 14 October 2012. A campaign led by two women asylum seekers has prompted Leeds City Council to take action against G4S. After visiting some of the squalid properties which G4S had tried to house people in, senior council officials ordered G4S to “undertake a full review of the property portfolio in Leeds to ensure they meet the contract standards”. One of the women who led the campaign, Ms A, along with her baby son, had been allocated a property in Leeds by Cascade Housing, a G4S housing subcontractor. The house was filthy, infested with cockroaches and the floors and walls were rotten with damp. Metal grilles covered the lower floor windows and the upstairs windows did not open wide enough to escape in case of fire. Ms A refused to accept the property and was taken to another Cascade house in the city. This house was also filthy with mould covering almost all of the interior. When she refused to accept this place as a home for her and her baby Cascade staff tried to forcibly prevent her from leaving the property. It was only after the intervention of some local people that Cascade let her leave the property, agreed to take her back to the original (cockroach-infested) property and promised to move her again. This move never came. Instead, Cascade carried out cosmetic “repairs” painting over mould, laying linoleum over rotten, damp, spongy floorboards. During this time Ms A experienced racial harrassment at night with people banging on the metal window grilles. One day she found a cockroach inside her baby’s bottle. Ms A contacted refugee agencies and campaigners and with the support of other women asylum seekers pushed Leeds City Council to intervene. Leeds City Council’s Housing Regulation Team and G4S visited Ms A’s house and three other squalid properties in the city. Following the visits, G4S agreed to re-house all four women in the properties and to fully repair the four houses before they are used again to house human beings. Recognising that these cases are not isolated ones, Leeds City Council is insisting that G4S reviews all of its asylum housing in the city. Sheffield, Teeside, Bradford, Hull, Kirklees and other local authorities in our region should pay tribute to the courage of women asylum seekers who stand up to the might of UKBA, G4S and their subcontractors and do the same. The story of Ms A was reported in The Independent newspaper on 14th December, four weeks after Cascade Housing and G4S dumped her there. On Monday 10th December The Independent published a story about the eviction of a heavily pregnant asylum seeker – she was due to have an induced birth on the day that Target Housing (another G4S subcontractor) forced her to move in Rotherham. The CEO of Target Housing at the time of this eviction, Gino Toro, is now employed by G4S as their “Social Cohesion” manager in the Midlands. The deadline for the completion of the COMPASS asylum housing contract in Yorkshire and Humberside by G4S was originally the start of September. When G4S failed to meet this target, UKBA extended it. A new “final deadline” – 12th November – was set by UKBA. When it became clear that they would fail again, G4S demanded that local authorities (who G4S had undercut to win the contract) pay to house asylum seekers for an extra month. Despite breaking the contract and failing to meet the November 12th deadline, UKBA gave G4S another four “final weeks” to do the job that they are being paid £135million of public money for in Yorkshire and Humberside. On December 4th G4S’s Stephen Small (with the chilling title of “Managing Director of G4S Immigration and Borders”) stated “We are pleased to have completed the transition of all the people in our care”. Two days later, Mr Small’s colleague at UKBA, Simon Walker, announced “COMPASS Project – Transition Complete” in a Corporate Partner Letter – End of Transition. 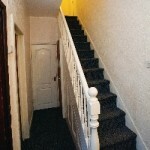 The story of Ms A’s squalid housing in Leeds indicates how G4S reached the latest UKBA-set deadline of 7th December. Her story, though shocking is not unusual, according to reports reaching us from around our region. Families from South Yorkshire have been moved 120 miles away from their friends, legal representation, support and communities to Teeside. In Teeside, Leeds and South Yorkshire people have been placed in areas where organised racist attacks are frequent. “Compliance checks on properties” have not been carried out before people have moved in. Glossy G4S “Welcome Packs” have not been completed with local details, making them useless to new residents. The letter from UKBA’s Simon Walker trumpetting the End of Transition tells us of another way that G4S have “completed the transition”. Walker explains guardedly that “asylum applicants dispersed to this area are now entering the G4S managed Initial Accommodation facility at Love Lane in Wakefield before moving on to G4S managed accommodation across the North East, Yorkshire and Humber”. The beautifully named “facility” on “Love Lane” in Wakefield is in fact the notorious Angel Lodge Initial Accommodation in the shadow of Wakefield Prison. This is not asylum housing, it is “Initial Accommodation”: the place where people seeking asylum are first housed when they reach the UK, before they are housed. One 8 year old child of an asylum seeking woman in Huddersfield found himself back at Angel Lodge where he came when he was one year old and newly arrived in the UK. In an attempt to “warehouse” people seeking asylum to mask their inability to properly house them, G4S are dangerously overcrowding Angel Lodge. For all of these reasons and in solidarity with the women asylum seekers of Leeds we repeat our call for an investigation into G4S’ use of public money to force asylum seekers into squalor. Take Action: contact your MP and ask them to demand an investigation into the UKBA/G4S handling of the asylum housing contract.